This manga anthology of eight stories by different authors deals with suicide attack squadrons (tokkotai in Japanese) that sortied from Navy and Army air bases in southern Kyushu during the last year of World War II. 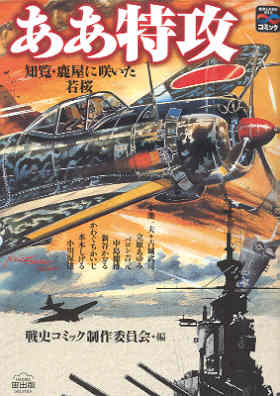 The "young cherry blossoms" in the subtitle refer to kamikaze pilots, and Kanoya and Chiran mentioned also in the subtitle were the air bases with the most sorties of tokkotai (special attack) planes for the Navy and Army, respectively. Most of the eight stories were originally published in the 1970s. The action for each manga story focuses on fictional characters, and actual battle history serves only as background, often inaccurate. The authors depict most characters' emotions and actions in a very exaggerated manner, so they have almost no connection to actual historical figures. The book's first story, entitled "Shiroji ni kuroku shi no maru somete" (Circle of death dyed black on a white background), takes up about 40 percent of the pages, whereas the remaining seven stories range from about 25 to 50 pages each. This first story presents a 17-year-old pilot, Daiya Horiguchi, with his squadron at Chiran Air Base. He flies a Type 97 Fighter (Allied code name of Nate) having the number 4-444, with 4 being pronounced as shi, which also means death in Japanese. When B-29 bombers are sighted heading toward southern Japan, Horiguchi's special attack squadron takes off to meet and engage them in ramming suicide attacks. However, his plane's engine catches fire, and he barely makes it back to base. The base commander court-martials him for disobeying orders by returning to base rather than trying to crash into the enemy planes. Horiguchi gets punished with an assignment to fly between Chiran and the Sixth Air Army Headquarters in Fukuoka in order to deliver names of pilots who will fly on suicide missions from Chiran. This task troubles him greatly, since he feels responsible for sending his friends to their deaths, and others start referring to him jokingly as Shinigami (Death God). He develops an affection for Noriko, a high school girl who works at Chiran Air Base to help maintain planes. She cuts the locks of her hair and gives them to him before he takes off with his friends on a suicide attack mission. 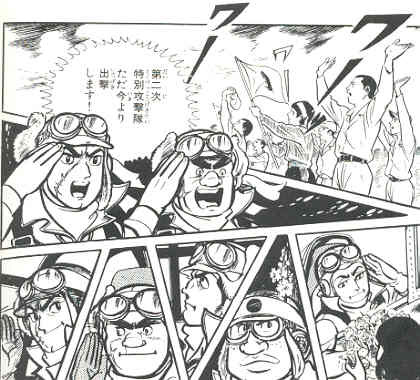 Horiguchi's plane gets shot down by B-29 gunners, but the last page shows him and his friends together happily after death. Horiguchi's story contains several historical inaccuracies. For example, although Chiran served as an Army kamikaze base during the Battle of Okinawa, Army special attack squadrons that made ramming attacks on B-29s did not use this base. The story depicts the Army's forming special attack squadrons at Chiran soon after the Navy's first kamikaze attacks in the Philippines in October 1944. In actual history, the Army's Shinbu special attack squadrons were formed at air bases other than Chiran, usually at ones on the main Japanese island of Honshu. After a short period of training, these Shinbu special attack squadrons then proceeded to Chiran Air Base and other bases in southern Kyushu shortly before the expected dates of their suicide missions toward Okinawa. Several manga stories in this anthology contain unbelievable characters. One story features a gambler who goes directly from jail to Chiran Air Base for his death sentence, although he manages to survive the war when his decrepit plane goes down into the sea and he gets rescued by a fishing boat. Another story depicts an easygoing kamikaze pilot who returns to base each time after being sent seven times with special attack squadrons on suicide missions. In addition to manga stories, the book also has a few pages of background information on Navy and Army special attacks. There are also pages on the Chiran Peace Museum for Kamikaze Pilots and the 2007 movie Ore wa kimi no tame ni koso shini ni iku (English title: For Those We Love). This book of previously published comics about special attack pilots most likely was published in 2007 to take advantage of the media hype surrounding this movie about Chiran kamikaze pilots. sortie from Chiran Air Base. From "Shiroji ni kuroku shi no maru somete"
(Circle of death dyed black on a white background).